Hi, Maddie here. I’m a very special guest blogger today on my Mom’s blog. I’m 8 years old and love cooking and baking. I’m kicking off a new series called “Kids Can Cook” where my mom and I will be sharing lots of fun recipes that are kid-tested and approved. This week we had my best friends over and we thought let’s make dessert! I wanted something simple so we still had time to play so we came up with the idea of making Chocolate Truffles. 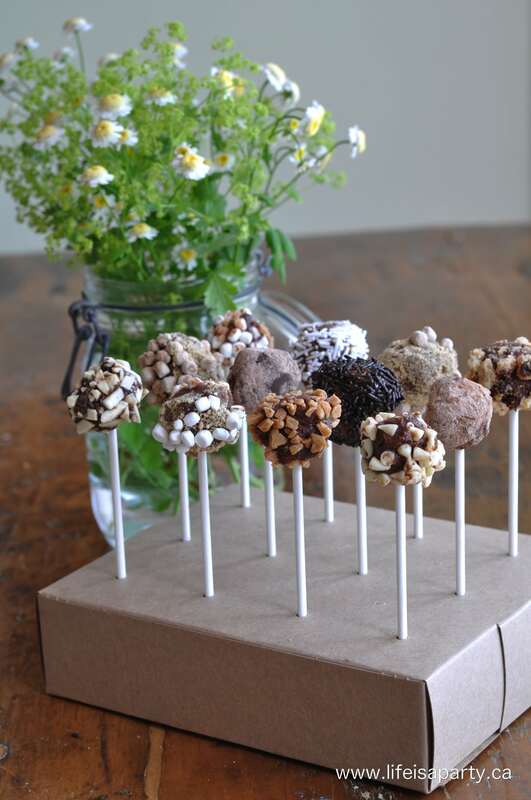 Since truffles are messy we decided to put them on sticks, and turn them into truffle pops! After we made our truffle base, we put them in the fridge to set, and got out all our yummy toppings. We decided to use mini white chocolate chips, chopped almonds, score bits, white sprinkles, chocolate sprinkles, cookie crumbs, coco powder mixed with icing sugar, and for a s’more one we did mallow bits which are teeny tiny dehydrated marshmallows, and graham cracker crumbs. Mom had to keep telling us to stop eating them, but they were too good to resist! Once the truffle base was set, we rolled them into balls, and then in the toppings -it sure was messy, and fun. Break up the chocolate into a mixing bowl, and pour the hot cream and butter mixture over top. Stir until the chocolate is completely melted and mixture is combined. Add in vanilla and stir. Allow mixture to cool for 30 min. 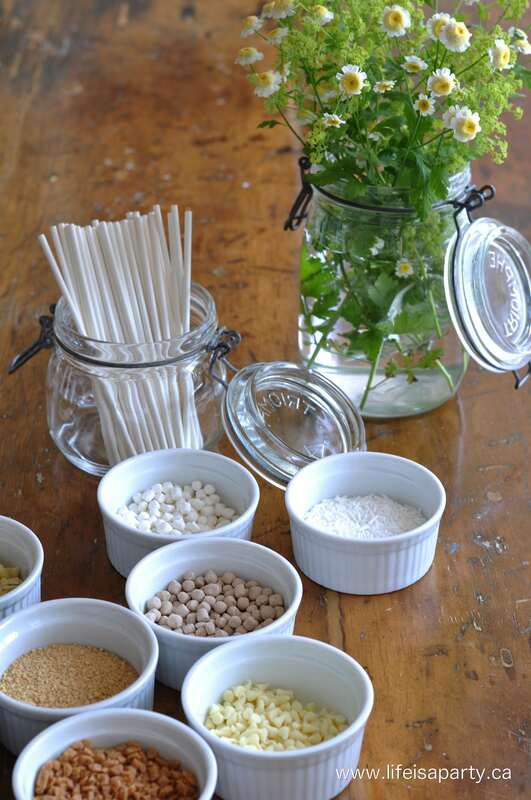 at room temperature, then place in the fridge for 2 hours to set. To make the truffle pops, use a teaspoon to scoop out a bite-size piece of the truffle mixture, and roll in your hands to form a ball. Roll the truffle in a topping of your choice, and insert a lollipop stick. Place finished truffle pops back in the fridge. Enjoy. The truffle pops turned out amazing and delicious, we really liked them. 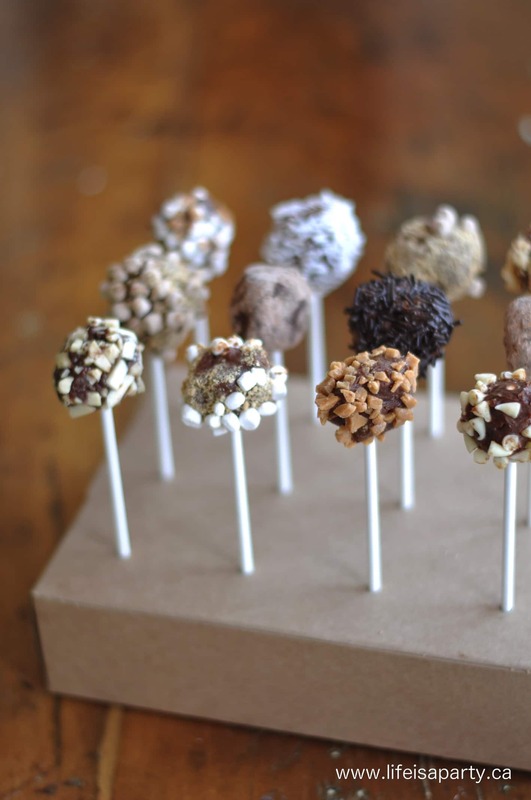 With yummy truffle pops -made by kids, life really is a party. Wow Maddie! I just read this blog post and am I ever proud of you! 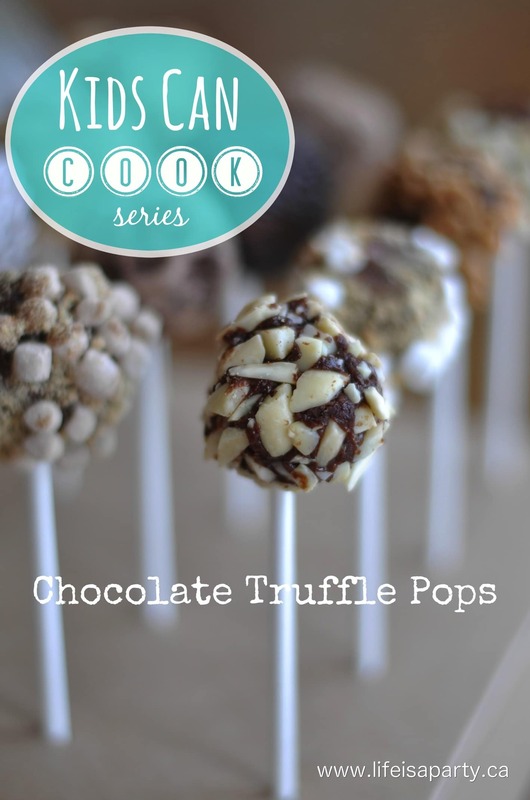 I can’t wait to try these delicious chocolate truffle pops out! thanks so much Mrs. Wright!